There’s one phone call all product review teams hate making. It’s the kind of call that requires a few brave deep breaths before you start to dial. And when you finally muster up the nerve to get someone on the other end, you begin to utter in the meekest of voices, “We broke (crashed) the product.” So imagine our surprise (and relief) when we called Reynolds to let them know we crashed their set of Strike SLGs and the first thing they said to us was, “That’s what we have RAP for”. But we are getting ahead of ourselves. 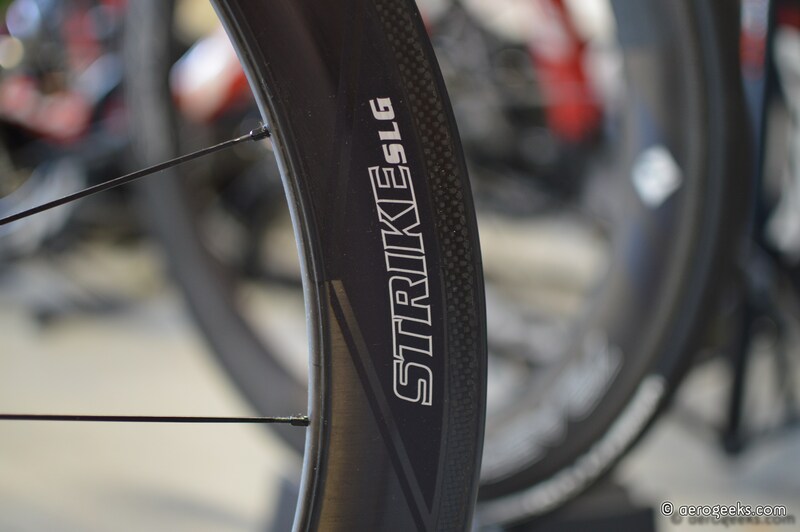 The original Reynolds Strike wheelset has been one of our benchmarks here at AeroGeeks headquarters. The wheelset has been available both as a stand-alone option and as OEM spec on a number of manufactures models for some time. It is reasonably light, fast, and handles well in the cross winds. 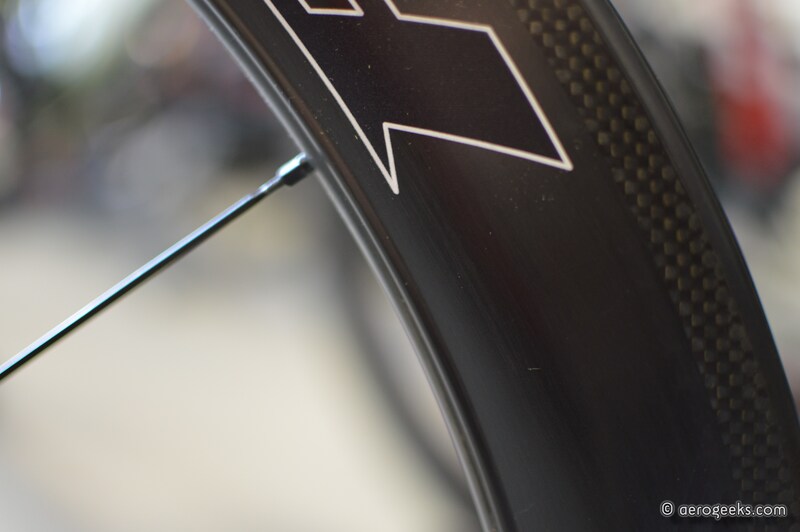 We covered the wheels briefly as part of our review of the Quintana Roo CD0.1. This year Reynolds has completely revamped not only the Strike but the lesser diameter Assaults, as well. 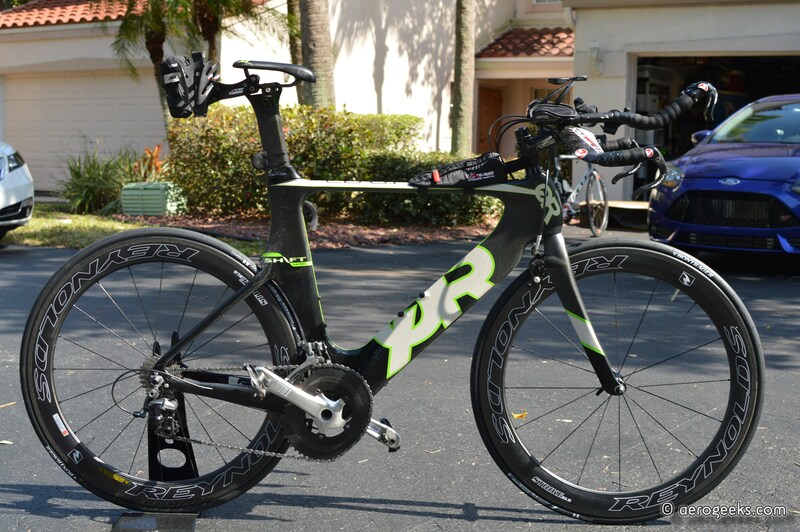 We got our first look at them at Interbike back in October 2013. Both wheels went from a 23mm brake track to a 25mm track. Rim depth has actually decreased from 66mm to 62mm. This is to meet expected UCI standards requiring rim depths to be less than 65mm in mass start races. The wheels are 20 spokes up front and 24 in the rear. Our set weighed in at 710g for the front and 898g for the rear. Reynolds first introduced its Swirl Lip Generator (SLG) on its RZR line. The original SLG was a .9mm “lip” placed on the sidewall of the rim near the spoke face. Testing at A2 demonstrated a time savings of 12.5 seconds over 40km. SLG effectively helps turbulent air passing over the wheel to re-attach to the spoke face after flowing over the spinning rim. It also decreases the side force acting on the rim, which smoothes turbulence and reduces drag. 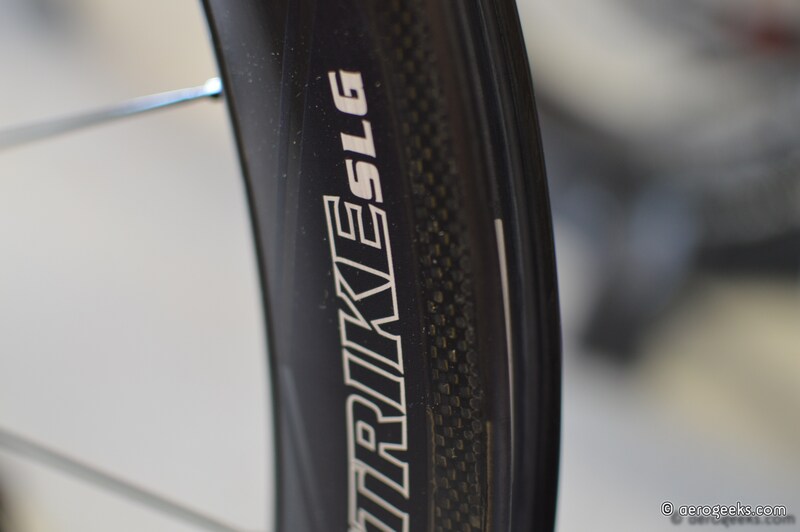 For the Strike SLG, Reynolds went with a lip that was 8X larger than the original. CFD analysis shows this Enhanced SLG brings a 35% aerodynamic performance improvement over the previous Strike model. We are huge fans of Reynolds’ braking performance – not just on these Strike SLGs, but on the original Strikes and the Aero 72/90s as well. For those unfamiliar, Reynolds bases their system on their Cryogenic Glass Transition (CTg) brake track. This proprietary carbon fiber laminate is claimed to run up to 53% cooler than standard braking systems. 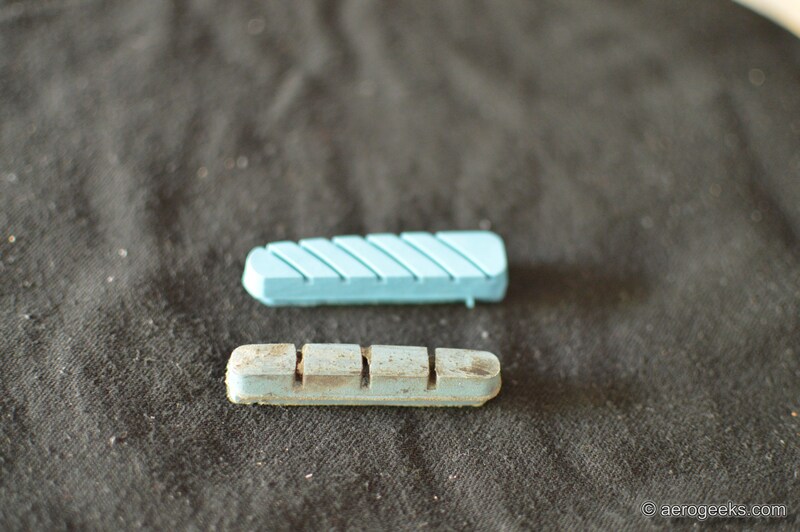 The brake track is combined with Reynolds Cry Blue power pads. We detailed the new Cryo-Blue Power pads in April (here) and came away impressed. At the time, we had combined them with 72/90 Aeros and almost locked them up on our first ride. The new pads have a 44% larger braking surface than the original Cryo-Blue design and six slots designed to help with cooling as well as water dissipation. The power pad (top) with a (slightly used) original pad below. Now back to where we started. During our second ride out with the SLGs we had an unfortunate incident. One of our editors took his eyes off the road, and next thing he knew he was rear-ending the rider in front of him. Of course this was no one’s fault but his own (certainly not the Strikes’). When we got our Quintana Roo CD0.1 test frame back to the garage there was some good news—no frame damage. Unfortunately the front wheel was not so lucky. The impact was straight into the cassette of the rider in front of him, and the carbon took some damage. This leads us to that phone call. We had to let Reynolds know their wheel was damaged and that we needed a replacement. But instead of this being an issue, it turned out to be an opportunity to talk about RAP. As with most major manufacturers, Reynolds already offers both a manufacturer’s warranty and crash replacement. The warranty lasts for two years and covers manufacturer defects. The crash replacement lasts a lifetime and is not limited to the original owner. Reynolds will rebuild wheels at a reduced price depending on the severity of the damage. In our case it would have cost us $750. But if we had RAP, it would have cost us exactly nothing. You could consider RAP to be an extended warranty, but it’s way more than that. For $250 RAP guarantees two years, two wheels – no questions. So if you have a crash or even run the wheel over in the driveway, Reynolds has you covered. Normally we are ones to pass on most extended warranties. But after we had a wheel last all of 80 miles before we rendered it unusable, next time we will be springing for RAP. So after all the facts and details, the big question remains: how do these wheels perform? We have been riding them weekly since March, both on solo rides and in a group. In that time we have never once had an issue with these wheels in a cross wind – they run fast and true. We took them climbing (at least South Florida climbing) and found them not to be overly heavy – the weight was never a factor in our experiences. Also, in groups with riders on deeper wheels (80mm+), we never felt ourselves wanting for more. Finally, when it came to braking, we continued to be impressed. For a full carbon clincher the braking is fantastic. No it’s not quite aluminum, but it’s close. The redesigned Reynolds Strike is a strong contender in the sub-$2K price point. Whether they are OEM equipment on a bike you are purchasing, or you are looking for an upgrade – the Strike SLGs are worth a serious look. The original Strike was a good wheel, but with this redesign, Reynolds has created something very special. And when looking for wheels to propel you to victory – special is never a bad thing.